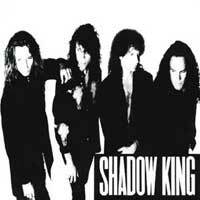 Shadow King were sort of a supergroup made up of Lou Gramm (Foreigner) lead and backing vocals, Vivian Campbell (Sweet Savage/Dio) lead and acoustic guitars, Kevin Valentine (The Godz) drums and Bruce Turgon on rhythm guitars, bass guitars, and keyboards. Bruce went on to join Foreigner and had previously worked on Lou Gramm's solo material. By 1991 similar 'supergroups' such as the Damn Yankees and Bad English were doing quite well. What Shadow King produced was basically an extension of what Foreigner were doing with "Inside Information"; melodic, radio-ready, pop rock or AOR. To be quite frank, the first time I heard this album it sound so light-weight and slick that I didn't give it a second listen. With Vivian Campell coming from the Dio camp, I was expecting something much harder rocking. Though a band like the Damn Yankees had their share of mellower songs, they also rocked hard at times and the personality of guys like Ted Nugent showed up in some songs. Other than Gramm, that is not the case here. Most of the songs on this album would make the first few Foreigner albums seem like heavy metal in contrast. Songs like "Don't Even Know I'm Alive" and "Once Upon a Time" are probably more fitted for a Lou Gramm solo record than an album marketed as a hard rock album. Despite my initial dislike of Shadow King's debut (and only) release, I eventually revisited it and discovered an enjoyable, moody, pop rock album with superb vocals. Lou Gramm is an incredible talent and has such a charismatic voice. The guitar work of Vivian Campbell is present as well, though certainly much more low-key that most Dio fans would have liked. It's no surprise that Vivian exited this band shortly after the album was released and announced he was joining Def Leppard. Since that time Vivian's disdain for heavy metal has been made well known. Fans of the lighter side of Foreigner or Lou Gramm's solo work will definitely find this album enjoyable. Shadow King is an album to put on for a quiet night with your spouse. Those looking for something more than that should look elsewhere.